Beach Lane Books, 9781481444026, 32pp. This bright and bouncy story in verse is about an array of pets and what they do. “Some pets slither. Some pets bound. Some pets scurry round and round.” Verbs describe how pets move, how they make sounds, how they eat, and how they show affection to their owners. The story ends with a statement about what all pets have in common. Humorous illustrations flesh out the simple text with mixed-media art that includes lots of cut-paper collage and what appear to be googly eyes. The bright, colorful illustrations are at their best when showing animals dressed for a costume party. Readers will have many observations about the animals in this story, as well as comments about their own pets or other animals they have known. Encourage young readers to find a word to describe how their pets move, make sounds, eat, or show affection, and, if appropriate, discuss the difference between nouns and verbs. VERDICT This fun, lively book will entertain kids at storytime, but it is also a simple way to begin discussing parts of speech. Recommended for all collections. 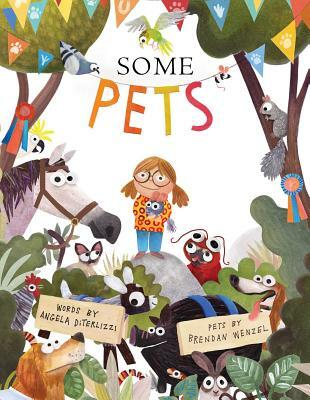 Using the setting of a pet show (a pretty raucous one), DiTerlizzi and Wenzel highlight the traits that make pets so great in this companion to 2014’sSome Bugs. “Some pets slither./ Some pets bound./ Some pets scurry round and round,” writes DiTerlizzi as Wenzel’s vivid mixed-media artwork shows a striped snake navigating an obstacle course, a rabbit bounding over hurdles, and a hamster giving it all he’s got on a wheel. Bouncy verse, playful illustrated details, and abundant affection between animals and humans add up to an exuberant reminder of the joy that having a pet can bring. Ages 4–8.